Perhaps it is a bit strange in itself to see a play that tells the story of three young slab boys in Paisley in Edinburgh. Despite the fact that I study in the heart of Glasgow, I do not actually know much about the history of it and its developments. Being aware of the legacy John Byrne has left for Glasgow, I was excited to see what “the Slab boys” had to offer. “The Slab boys” is an energetic and humorous production and although I had my initial problems to understand the main characters, Phil McCann (Sammy Hayman) and Spanky Farrell (Jamie Quinn) joking about at the very start in thick weegie slang, I managed to pick it up quickly and get sucked into the world of late 1960s Paisley. The King’s Theatre was a great location for the play, as the stage did not need to be big and would only have wasted space in larger venues. The slab room is the only place of action which does not make it boring in any way – there is constant human traffic in the slab room so that one almost forgets that it is just Phil, Spanky and Hector (Scott Fletcher) who belong there. The fashion is very much of their time and adds, together with the superb acting of the cast, to the authenticity of the play. Phil and Spanky do not take their job very seriously at all and seem to have a better time making fun of Hector, the third Slab boy, or the new boy Alan (Kieran Baker). They make it clear enough that they do not like being bossed around or taking orders, if it is by Plooky Jack (James Allenby) or Willie (David Hayman). 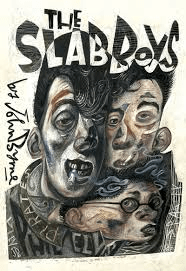 The Slab boys’ jokes are clever, witty and usually borderline offensive – a perfect example of Scottish humour. Posted in Arts and tagged play, review, theatre. Bookmark the permalink.